This was perfect timing for me, I was going to drag my words out of hibernation but saw this Evergreen set up and chose to go that route with a single and then turn it into a 2x2. The only issue with going to a 2x2 from the original is that the off sim islands sit right in the middle of the new land. At first I was confused and thought it was part of the land build (til i fell through lol) - then just deleted them and got to work working my new 3 flat land additions in a way that would blend with it. There is still water pretty much all the way around the Evergreen Island, so that part isn't bothered at all. This was exactly what I was looking for and provided inspiration for the whole 2x2. Thanks to all of you involved. Moonrise wrote: This was exactly what I was looking for and provided inspiration for the whole 2x2. That's great, Moonrise. It's exactly what the team behind this was hoping for -- that it would spark further ideas! If you do enlarge the world, the islands can be moved so that they are once again off-sim if you want to go down that route. They can also be rearranged to make a bigger off-sim island, whatever size world you go for. I am working on a blog post covering a brief tour of the island, and a look at how easy it is to customize and expand. So stay tuned for that tomorrow! When people have had a chance to play some more and start doing their own thing, I would LOVE to see your screenshots and stories. I am sure the rest of the community would too! Moonrise - Dot is correct. If you highlight the island in edit mode and cam out, you will see the island and in the sky above it nearby will be a box prim. This box prim is the "root" prim in the linkset. So long as this prim remains on your sim somewhere, you can move the off sim stuff around to suit your tastes. Try copying a few of them (by taking to inventory or shift-dragging them) and adding more! You could even create a basic "sim surround", making it look like your sim is in a bay or circled by mountains entirely! I will go into this in my blog post. I just ended up picking up the extra islands - but it's good to know that they can be used. I will certainly pass along some pictures of what Im creating when I'm a bit further along:) Thanks again. Very happy. I put up a default Evergreen Island world so that folks can tour it who haven't yet signed up to Kitely. The name of the world is... Evergreen Island! I think this is a great move forward for Kitely. Many folks are just not great landscapers and now they can have an instant beautiful world of their very own. Well done! Last edited by Serene Jewell on Thu Mar 03, 2016 5:08 am, edited 1 time in total. Ilan wrote: From Feb 18 to Feb 27 the new world template was used to create 55 new worlds. For comparison, the Empty World template was used to create 77 new worlds during that time. No new worlds used the Universal Campus world template during that period. [I don't have] the stats for the total number of worlds created during that period so I can't tell you how many people used the Upload OAR option but even without this info you can see that the Kitely Evergreen Island is a popular option. Fantastic news . So I guess that would mean (if the numbers theoretically remained stable week on week) in a month there would be around 220 downloads. I was talking to a new user who ran into a little confusion. They wanted to use Evergreen Island to be part of a 2x2. But when you are signing up you can only make it a 1x1 in the world creation screen. I tried to explain how you can resize the world after the fact in the "my worlds" panel, but it did cause a bit of confusion. I dont know how possible it is, but it would be great if the world resize could be part of the initial setup somehow. Btw sorry I didnt make it to any community meetings since the island has been released. Ill be there this week. This isn't the first time I've heard of people being confused about this. We'll see what we can do to avoid this problem. 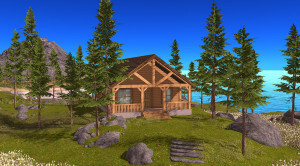 I made some photos at Kitely Evergreen Island. All of them are now at my website. There are and will be soon all at my Flickr, CC licensed. I live among the trees. You are invited too:) Visit 21strom. My Kitely Market. 21strom webpage.